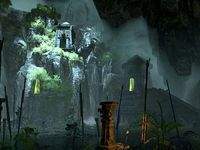 A spacious and well-watered cave system in Murkmire would normally be used or inhabited by some of the local Argonians, but Tsofeer Cavern is avoided even by the aggressive Dead-Water tribe, all because of one dread word: "Wuju-Ka." Tsofeer Cavern is a delve in Murkmire. Explore and clear Tsofeer Cavern. This page was last modified on 22 November 2018, at 04:18.